A collection of free Mopar screensavers featuring Chrysler, Dodge and Plymouth cars and Trucks for your windows pc. Our screensaver collection offers a fun, safe and easy way download free Mopar related screensavers. Each collection Features a great selection of high-quality and professionally designed screensavers. Each screensaver in our collection has been tested for quality and contains no adware, no spyware and is virus checked. 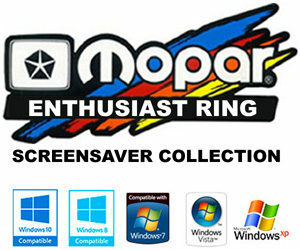 Plus the Mopar Enthusiast Ring does not require you to register your e-mail to download or use our screensavers. Bouncing Logo Series – A collection of free Mopar related screensavers featuring vintage American Motors, Chrysler, Dodge and Plymouth logos for your windows pc. All screensavers in this series are compatible with both normal and widescreen monitors of all sizes. Mopar Or No Car Series – A collection of free screensavers featuring mopars. Designed for standard resolution and widescreen monitors, Each version features full screen Mopar related images**. Designed for Microsoft Windows 10, Windows 8, Windows 7, Vista and XP. Mopar Or No Truck Series – A collection of free High Definition (HD) screensavers featuring Dodge and Ram Brand Trucks. Designed for widescreen monitors, each version features full screen Mopar truck related images*. Designed for Microsoft Windows 10, Windows 8, Windows 7, Vista and XP. Please Note: Mopar Enthusiast Ring Screensavers were created by mopar-ring.org and are the property of the Mopar Enthusiast Ring. All related files and documentation is Copyright © 1996-2019 mopar-ring.org, All rights reserved. All other trademarks or registered trademarks mentioned are the property of their respective owners. These Screensavers are free for your personal use at home or work. They may not be posted to other websites or used in any other way without permission from the mopar-ring.org web site. By downloading a screensaver on our site you agree to abide by these terms. This free software is provided "as is" and as all software extreme caution should be used when installing it on your system.